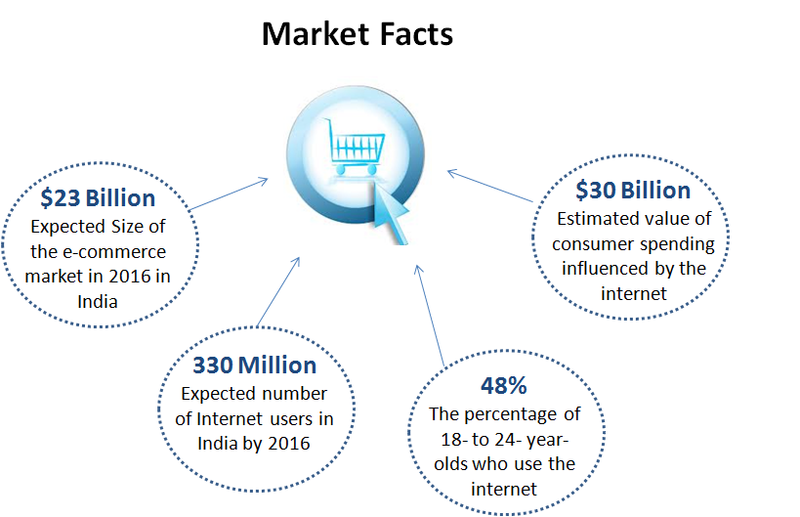 To see big wins in e-commerce today, entrepreneurs need to cover all of their bases, from organic SEO to mobile advertising. Analytics tools can create a pretty detailed snapshot of where your business stands — too detailed, in some cases. Curious about which metrics really matter, a panel of successful e-commerce entrepreneurs reveals that which pieces of data they measure regularly and what it tells them about their overall strategy. Their best views are below. If you are in the e-commerce world and you don't know how many users are landing on your page, the conversion rate of users to paying customers and the cost of that user landing on the page (versus the profit you make in sales), you may not be in the industry too long. SEO is one way to get an audience, but sometimes you have to pay for users, and you have to know what that converts to. If you have returning clients, it's important to know the average retention you will have, as well. Track information on our users at TuneBash. There is a great quote and it's good for the e-commerce world: "If you can't measure it, you can't control it." You work hard to get people to your site. You work harder to give people something they want to buy. Customers click that beautiful "buy now" and go to the checkout page. And they don't buy? What happened? Keeping a log of abandoned carts gives you the opportunity to ask customers why they didn't buy. Recently, we saw a customer who had five abandoned carts in a period of a couple of days. It turned out that the e-commerce site didn't accept Canadian billing addresses. Whoops. Abandoned carts are one piece of data you should look at and follow up on if you have an e-commerce site. In Google Analytics, you can now set up split tests called "experiments." You can set goals and run multiple pages against one another. Rather than guess what works on your Web pages, I highly recommend you split test all important elements. I bet you'll often be surprised at the results. They're not always intuitive. How much is each visitor generating in revenue? If you know that number, you can budget how much to spend to buy traffic to your site, and you can work on improving that number by increasing conversion rates and customer value. The lifetime value of each customer over a certain period of time and from a specific traffic source is key. You could build campaigns to sell one product to one person one time. But how do you build out a marketing plan that continues to engage both past and present customers and drive demand for both present and future products? Obviously you’re going to get traffic from people, who are looking for you, but it’s really a question of how much traffic you are getting from people who aren’t looking for you specifically, but rather for something you’re selling. The biggest opportunity to make more money comes from non-branded, organic traffic. 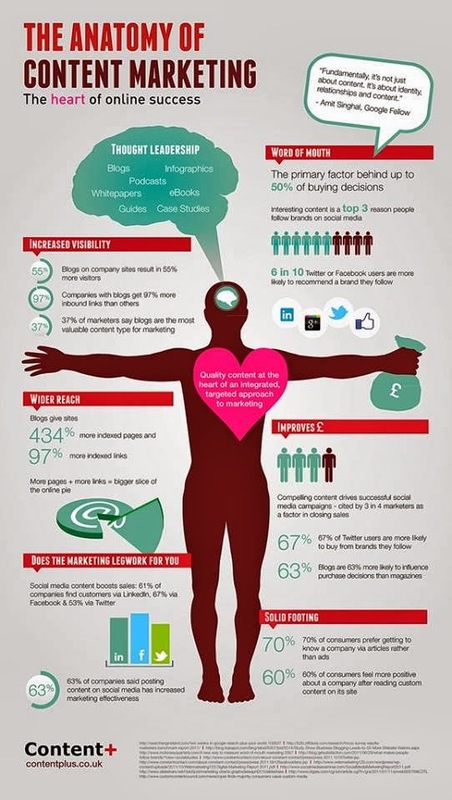 Many online businesses start advertising on the Web without actually tracking the ROI of each particular lead source. By diligently tracking this metric, you can know which particular lead sources are profitable and which ones to cut. On a deeper level, you can use this to split test advertisements on a granular level to find out which ones will maximize your ROI and develop the best ads. Beyond the obvious metric of CPA (cost per acquisition), we tend to focus on the purchase funnel. Understanding where and when a customer drops off the sales process is just as important as understanding the conversions coming in. Without understanding this, you cannot optimize and refine for increased conversions. If you don't have a mobile-optimized website, you are in trouble. Most of the e-commerce companies create a monthly report based on mobile usage, and we were stunned to learn that approximately 20 percent of the users view the website on a mobile device. Take a look at analytics and work to create the best shopping experience possible across all mobile devices. More, more, more. Everything's always better when there's more, and your browser toolbar space is no exception. With compelling online content behind every click, it's easy to find yourself overwhelmed by too many open or saved web pages. Whether your bookmarks bar is jammed with countless interesting sites or your tabs bar is overloaded, here are some simple ways to maximize the real estate in your browser toolbar. In Chrome and Firefox, you can pin tabs to minimize them to their favicons ("favorite icons") in the toolbar. To do this, simply right-click on a tab and select "Pin Tab." You can also create more room in your Chrome and Firefox bookmark bars by simply removing the names for each bookmark. This, again, will leave the bookmark with just the site's favicon. To do so, leave the "Name" field empty when you bookmark a site, and the browser will save the favicon alone. If some of your sites don't have favicons, check out the I Hate Your Favicon app, which allows you to upload custom icons. This may be a no-brainer, but folders help you organize and declutter your bookmarks bar. Just right-click your bookmarks bar, and select "Add Folder" in Chrome or "New Folder" in Firefox and Safari. If you still prefer naming your bookmarks as opposed to just seeing the favicon, try using browser add-ons and extensions. Different browsers offer a variety of tools, though there are more stable bookmark add-ons for Firefox than there are extensions for Chrome. Smartest Bookmarks Bar allows you to see the names of your bookmarks when you hover over them. 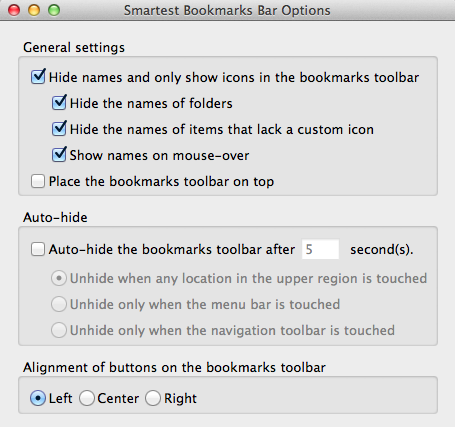 Another option is the Roomy Bookmarks Toolbar, which has similar functions. It allows you to also add multiple rows of bookmarks, though this feature is a bit buggy. 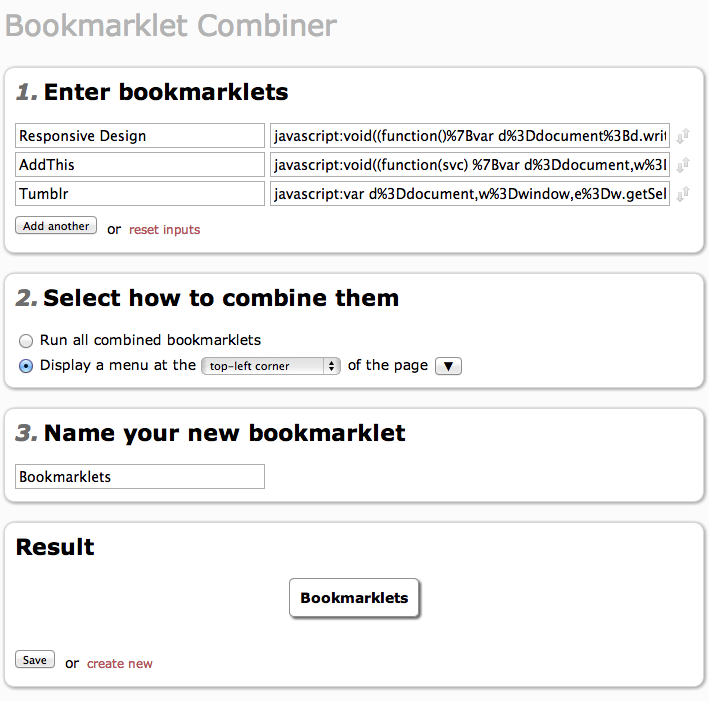 The Bookmarklet Combine allows you to put all of your bookmarklets in one place. While this can be done with a folder function in the toolbar as well, the Bookmarklet Combiner provides additional functions that may prove even more helpful, including the option to run all of your combined bookmarklets at once, and various display options. For shortcuts rather than bookmarks, you can add an extra toolbar in Firefox. To customize your Firefox browser, right-click on an empty section of your tab strip and select "Customize." From this menu, click "Add New Toolbar" and give it a name. 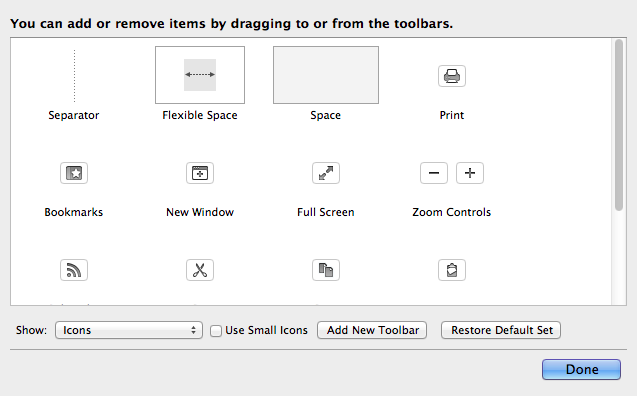 To save it, you must immediately drag something from this menu onto the toolbar. You can't actually drag individual bookmarks onto this bar (though you can choose to drag all of your bookmarks onto this bar), but it does provide another accessible menu for shortcuts, including History and Print. Do you have any tips for getting the most out of your browser space? Share them in the comments below. 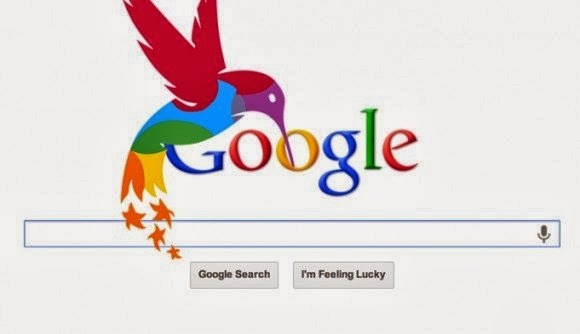 Google’s latest Hummingbird algorithm change is possibly the biggest thing to happen to search for a long time. One of the biggest alterations is that Google has now shifted increased focus onto ‘Evergreen’ content or articles that offer more depth, are established and very descriptive. Creating ‘evergreen’ content however is often easier said than done as it takes a lot of preparation and work. However, when it does go right, it provides a lot of rewards even more so now Hummingbird is with us. So, let’s take a look at six of the best but most attainable forms of evergreen content. ‘How to’ posts are a fantastic form of evergreen content and a lot of the instructional posts of this nature tend never really to go out of date. Think of how often you go to search for how to do something online – if you’re like us nine times out of ten. Of course, there are plenty of ‘How to put up a shelf’ articles out there –so the only way to truly benefit is to create the best one out there. Comprehensive articles that take time and effort offer the real rewards here, while a bare 400 words is never going to compete in race and will have shed its leaves within weeks of posting. The other thing about the How-to post is it can be updated – so take for instance a post on how to change the display settings on a Samsung Galaxy S4. Next, year with a few tweaks you can update it to provide the same instructions for the Samsung Galaxy S5. This means that though it’s an investment in the short term, well put together evergreen content like this can really push traffic in the longer term. Often when we start working on something new, we come across fundamental terms that we’ve never had a notion of beforehand. The ‘what is a (item)? Post is also a great back to basic offering and one that can be extremely successful and as most items are always the same, the post will always work. Once again, ensure it’s the definitive post on the web to get the right amount of traffic. Lists are fantastic for sharing, generate large amounts of interest and are easy to compile, change and compare. Websites such as Listly, allow you to create socially shareable lists that can both look great and also keep attention spans for relatively prolonged periods of time. Listly also allows users to help curate the posts themselves and add to them, pushing the social element, as well as the curation side of things. The story of something is often a good way to create something of the evergreen nature. Creating ‘history of’ or ‘The Story of’ posts can be a great way to create interesting reading that never goes out of date and will be searched for on a daily basis. Depending on the industry, curating news and up-to-date information and bringing news and views together in one place can work well once relevant. Just add a link and a brief synopsis and watch as you’re elevated in your industry to the status of a go to person and watch as people consistently return to your site each day to follow the latest in the industry. It’s not necessarily evergreen content, but it’s an evergreen attitude. Today, everyone is a typographer. If you have access to a keyboard and a basic software program, you have control over typography. For instance, if you construct email, write for a blog or build presentations, you have a type of control over your words and letters that your great grandfathers would envy. Be thankful. Typography used to only be an art form available to the ink-stained laborers of the early 19th century. A lot has changed, but the sad reality is that even though today’s presenter has control over type, most don’t quite understand — much less utilize — it as an art form. It is one, and its power can be immense. For starters, if you have a brand style guide, stick to it. There are most likely 1-2 fonts that you must adhere to keep brand consistency. If so, follow the rules. If not, take advantage of the opportunity to seek out a new font that is still visually engaging and in a similar font family. Aim for only two font styles. Why? One font style is too boring. Three font styles are too much. Consider two font styles as the Goldilocks approach. It’s just right. If you insist on using multiple fonts, three should be the absolute cap. Think 500 point size. It was go big or go home, and it’s a simple and easy design tactic that anyone can implement. Certain points are always going to be more relevant than other items. For instance, let’s look at the phrase “Change the world.” Depending on your perspective, you may want to really emphasize the idea of “Change.” Utilizing the bold feature to create contrast with your message then becomes essential: “Change the world.” Even with something so simple like the phrase above in this blog post, adding contrast adds plenty of visual value. At the end of the day, your font choices need to be easy to read. It’s that simple. If you can’t decipher a letter, then you can’t expect your audience to decipher it, much less comprehend your message, as well. Choose wisely.